The new TTC board is scheduled to tackle the ongoing effort to improve accessibility at its first meeting Thursday, but advocates for people with disabilities say that effort isn't going far enough, fast enough. The new TTC board is scheduled to tackle the ongoing effort to improve accessibility on the transit system at its first meeting Thursday, but advocates for people with disabilities say that effort isn't going far enough, fast enough. "Frankly, I'm quite appalled," said Franklyn McFadden, a transit rider and accessibility advocate who relies on a power wheelchair. McFadden, 32, will be watching as the new TTC board discusses the $9-million purchase of 48 new minibuses — wheelchair-accessible vehicles will be used to augment the transit system. "The new improvements do not go far enough mainly because the new minibuses function just like minivans," McFadden told CBC Toronto. A TTC report says the buses can sometimes only accommodate one wheelchair at a time. 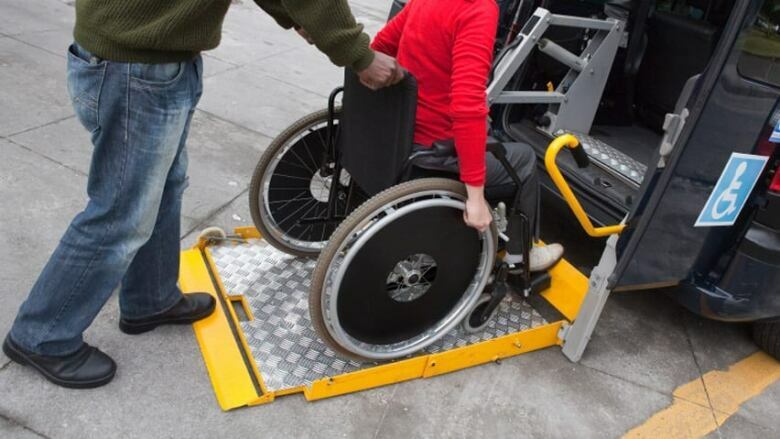 The report estimates there are as many as 10 Wheel-Trans customers in Toronto whose wheelchairs are so big they won't be able to fit in the new vehicles at all. "As the population continues to age, many more will probably depend on mobility devices that are going to be larger and more cumbersome, so for the TTC to move towards this minibus scenario doesn't work in my opinion," said McFadden. A passenger in a wheelchair boards a TTC Wheel Trans vehicle. The report says the TTC is trying to secure larger vehicles. In a statement to CBC Toronto, the TTC said "through this selection of vehicles, we are accommodating customers with mobility devices. If a customer has a specific concern or needs specific service, our Wheel-Trans customer service team is there to support them." Right now, 45 of the system's 75 stations are accessible and upgrades are underway in five stations: Royal York, Dupont, Wellesley, Yorkdale and Chester, according to the TTC. The TTC started to make subway stations accessible in 1990 and has a target to complete all subway stations by 2025, which means they are trying to complete an average of three stations per year, a TTC report said. But that means right now roughly 40 per cent of transit stations are not accessible. "We were supposed to be further ahead with the elevators than we are," said advocate Adam Cohoon, 38. "It seems like we're just going to slip under the deadline. But getting Wilson and Runnymede, two of the more complicated stations, underway is a good thing." In a statement to CBC Toronto, the TTC said "some of our stations will require major renovations to accomplish this, but we have a plan and are working hard to meet the deadline [of 2025]." Since so many stations aren't yet accessible, Cohoon only takes the subway a few times a year, and only in the downtown core. He said overcrowding on the trains make them even less accessible, because people in power chairs can't fit. "The regular system is overcrowded and we take up more space and it's one of those things where you're starting to wonder where are you actually wanted," Cohoon said. Shelagh Pizey-Allen, executive director of the transit advocacy group TTCriders, is worried the provincial government's plan to take over Toronto's subway system will also impact the ongoing effort to make it more accessible. "The province's plan to break up the TTC raises serious accessibility concerns, from higher fares on the subway to responsibility for elevator maintenance." Other accessibility concerns Pizey-Allen will push the TTC board on this year include halting transit fare increases and adding visual display alerts for service updates. "People in the deaf community and those hard of hearing have been contacting us about the fact that they don't have a means of learning about delays, subway shutdowns, or emergencies, which discourages people from riding transit," she said. She said this service is becoming more necessary with the phase-out of collector booths and TTC on-site staff.